Let's all climb aboard the Toy Soldiers Forever! 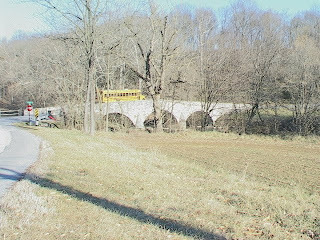 schoolbus and travel to Sharpsburg Maryland to visit Antietam National Battlefield, or at least a miniature version of that remarkable park. as we make it to the other side of Antietam Creek, no worse for wear, just a great deal smaller. a very small, and not particularly "in-scale" rendering of my favorite National Park. As the bus pulls up to the Mumma education center in the background, I've continued into Sharpsburg to get lunch (miniaturization always makes me hungry). The Mumma house and barn were burned by the Confederates during the 13-hour battle of Antietam on September 17, 1862. The Mummas were able, however, to rebuild within a year. A happy ending for the Mummas. This spring I set up shop in that very Mumma barn to create this enormous map. The map and all the various components will be part of a new education program for elementary school kids on mapping and the history of the Antietam Creek Valley. Perhaps afterwards their teacher will take them up into the observation tower. I happily agreed to fabricate all of the components for this project and began in late spring. Painting the map was really fun, but even more so was working with the basswood. I still have about a half dozen elements to fabricate and by spring this program should be ready to trot out for the kids who travel here in those full-size school busses. Come on out to Antietam sometime and experience the real thing, in 1:1 scale.